MWS appeal succeeds! Guilford approval denied at the Chareles County Board of Appeals, but is being appealed by the developer. During the November 16, 2016 continuance of the appeal, the Charles County Board of Appeals unanimoulsly overturned approval of the huge Guilford subdivision proposed for Bryans Road. The significant impacts to traffic and safety, and the shoddy adequate-public-facilities analysis loomed large in the Board’s decision to deny approval. The people who use Billingsley Road, who appreciate Audubon Important Bird Area or globally rare habitats like the Magnolia Bog, and who enjoy Mattawoman Creek can now breathe a bit easier, though the developer is appealing the decision. Guilford: a huge subdivision in the wrong place. The Guilford project involves a 438-unit subdivision proposed for a 183-acre forested site in Bryans Road, MD. It would erect 140 apartments, 171 townhouses, and 127 houses. Charles County's 2016 comprehensive land-use plan recognizes how inappropriate this project is: as a result of the plan, new zoning places the site within the Watershed Conservation District (1 unit per 20 acres)! Unfortunately, the preliminary plan had already been approved before the new zoning. It would add over 3,000 car trips per day on Billingsley Road, a 60% increase. Yet traffic on Billingsley was used by Charles County as an excuse to propose the Cross County Connector (CCC), even though growth induced by the CCC would have crowded Billingsley over time. Wetland permits for this highway were denied by the Army Corps of Engineers because viable alternatives exist, and because the highway was "contrary to the public interest." The CCC would have also irretrievably destroyed Mattawoman Creek with the polluted runoff from facilitated sprawl development. Guilford is a leftover of the failed CCC and the old sprawl-promoting comprehensive land-use plan. Yet the Charles County Planning Commission, in a split vote, approved a "preliminary plan" for this very large subdivision that would add 3149 car trips per day to Billingsley Road, with only the flimsiest of traffic considerations. MWS and local homeowners challenged the approval at the Board of Appeals, and won. The Guilford site is nearly 100% forested. The Guilford preliminary subdivision plan contains 140 apartments, 171 townhouses, and 127 detached houses. Because the public was shut out, the Charles County Planning Commission was not informed of many aspects of the project. Some Planning Commission members asked excellent questions about the impacts Guilford would have to Mattawoman Creek and to Billingsley Road. In response, county planning staff allowed the developer to supply answers that are incomplete. A poster child for excluding the public: Charles County's Planning Commission approved the preliminary plan for the huge Guilford project proposed for Bryans Road on May 18, 2015. Three dozen citizens stood silently holding signs asking for a hearing, but were erroneously told that it was impossible. Then over four dozen citizens and two organizations wrote the Planning Commission requesting that it reconsider the approval. The Planning Commission refused to reconsider on July 13th, 2015. Letter asking for a reconsideration of the Guilford approval is here. This single project would add 3,149 vehicle trip per day to Billingsley Road, a 60% increase. Yet no analysis is provided of the traffic that will be generated on various segments of Billingsley Road. For example, staff says the accident rate is larger east of the site in the direction of Bensville Road, but does not inform on the car trips per day that would head in that direction. A large fraction of Guilford's traffic would turn onto MD 227 from Billingsley Road. The 3149 trips per day from Guilford amounts to over 30% of the 10,110 trips per day now carried by MD 227.2 This is a major increase. Traffic at the intersection of Billingsley and Route 227 would be clogged to a "failing" level of service, i.e., gridlock. Planning staff recommends "mitigation," but is silent on the level of service that would result. Back-ups on MD 227 would block the Bryans Road firehouse during peak hours. Adequate public facilities analysis is supposed to examine public safety, but this concern has been ignored. Students from Guilford would attend J.C. Parks Elementary School and Matthew Henson Middle School. Both are overcrowded (beyond state rated capacity) and house students in "temporary classrooms," that is, in trailers that have become essentially permanent fixtures. The site would be covered by a whopping 18% impervious surface! This is well beyond the ~10% threshold for irreversible degradation of aquatic life. It is even beyond the 15% level where experts tell us that "the likelihood of recovery is marginal." This is precisely how we lose functioning watersheds, by destroying one stream at a time. The site is laced with streams. After accounting for the acreage in stream buffers and floodlplain (that must be left as forest), the remaining areas would experience a 30% impervious cover. Small tributaries would be damaged beyond repair. A wetland of special state concern on the site is a globally rare Magnolia Bog. It has the highest possible rank for rareness, called G1 by conservation biologists. Charles County has already damaged its only other example, Araby Bog, with a leapfrog development. When communicating with the Planning Commission, County planning staff refer to this wonder merely as a non-tidal wetland. Sweetbay Magnolia in the threatened Bryans Road Magnolia Bog. 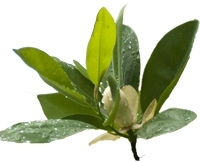 A Magnolia Bog relies on perpetual seeps to keep it wet. Seeps are fed by rainwater infiltration that could be blocked by the high degree of impervious surface. One reason these fragile bogs have become so rare is that many seeps have dried up over time due to development such as Guilford. "The County cannot rely on State and Federal regulatory programs within their limited scope of review to protect the aquatic resources of the Mattawoman Creek." The site drains to reaches of the Mattawoman used by River Herring. These fish swim here from the Atlantic Ocean each spring to spawn. Besides being an ecological cog that transports protein to our small streams from the ocean, these "anadromous" fish provide anglers an early spring experience, and are forage for Striped Bass and Largemouth Bass. They are severely depleted on the east coast. Mattawoman remains an important hotspot, but upstream spawning has plummeted in recent years. The loss is linked to impervious surface and overdevelopment, just as Guilford represents. The staff reports do not explain the extent to which Environmental Site Design will be practiced to the "Maximum Extent Practicable," or MEP. What are the limitations to MEP for this case? Were excuses given to reduce modern stormwater treatment as not being practicable? Shouldn't planning commission members be given such information, since they are ultimately responsible? 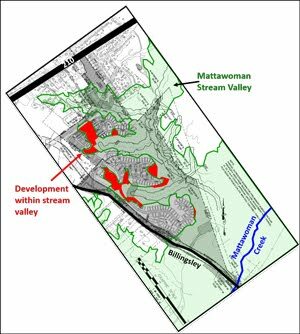 In 2003, the Army Corps of Engineers stressed how important is was to protect the Mattawoman Stream Valley to the top of the slopes. The idea for an ordinance to accomplish this died in a "commissioners' task force" stacked with developers. The Guilford project violates the Stream Valley. It is long past time to keep development out of the Stream Valley. within the Stream Vally is shown as red. The entire site falls within the state's Targeted Ecological Area. Nearly the entire site falls within scientifically delineated Audubon Important Bird Area. 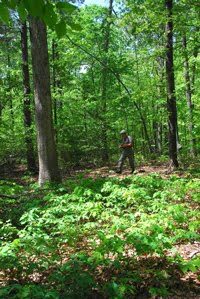 Nearly the entire site is "hub" forest, an important component of Maryland's "green infrastructure." Most of site ranks high for natural stormwater infrastructure and as an upland preservation opportunity in the Watershed Resources Registry. 1 Appendix E, (Traffic Analysis) in Charles County’s reply of May 8, 2009 to a query by the Army Corps of Engineers concerning the Cross County Connector. 2 Draft Comprehensive Plan, Figure 8-1, p. 8-7. 3 Letter to Melvin Beall, Charles County Planning and Growth Management, from William Seib, Chief, Regulatory Branch, U.S. Army Corps of Engineers, Baltimore District, dated November 19, 2008.